Los Gatos, CA, January 26, 2016 – The Smart Home ecosystem comprises both hardware devices and software apps and together they are supposed to make an efficient system for consumers. A new report from Argus Insights shows that consumers are overall more frustrated with the applications that dictate, schedule and manage each device than with the actual devices themselves. Past Argus Insights reports looked at the hardware component and the challenges and irritations customers were experiencing with installation and connectivity, but this new analysis introduces a new data set to uncover the fact that consumers are experiencing even more issues with the apps that run these devices. “Companies that have aligned their entire ecosystem to delight consumers will outperform the rest of the market in the long term. Look how Honeywell came from behind to beat Nest with an overall better experience!” said Dr. Feland. 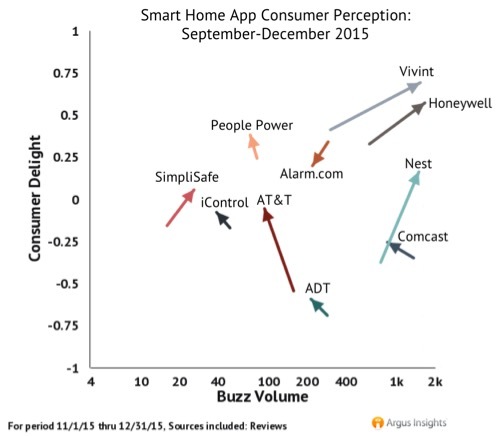 Argus Insights found while software is very important in the consumer perception of the Smart Home experience, it is sometime very different from consumer perception of corresponding hardware. For example, Philips devices receive a higher delight score than Honeywell devices, but Honeywell’s apps are the most delightful according to the research, while Philips apps are the least liked. 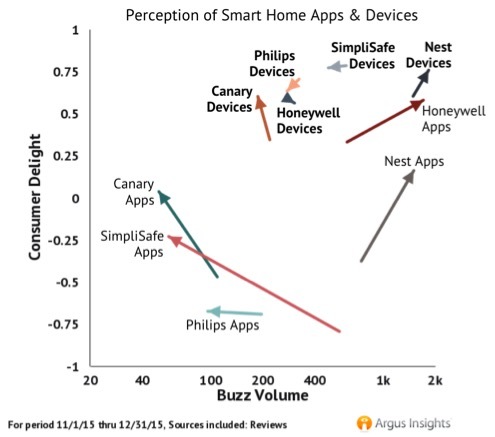 This scenario results in Honeywell providing a better overall experience across the entire Smart Home ecosystem, while Philips consumers report a foreboding gap in the experience between hardware and software. Delight for Smart Home apps as a category is far below delight for the devices, but is very slowly starting to improve. Philips represents a market trend of devices that are far more delightful than their apps, creating a dangerous gap in the overall customer experience. App functionality is a major consumer pain point, with frequent complaints of slow video streaming , long load times and the video blacking out. Argus Insights is founded on the fact that mindshare anticipates demand. Through curated analysis of global consumer reviews and social media conversations, the firm provides comprehensive visibility at market, product, and attribute levels to determine what is delighting and disappointing the market. Through insights derived from the firm’s proprietary customer insights platform, clients take targeted actions to improve market fit and revenue performance so they can surpass their competition.